This is a genuine Dell original Motherboard (systemboard / mainboard) compatible with the Dell XPS 14z (L412z) Ultrabook / Laptop that come with Discrete Nvidia Graphics. Includes on-board Intel i5 2450 2.5Ghz CPU. This motherboard is compatible with systems that have the Discrete Nvidia Graphics. This not a compatible replacement for L412z systems that have Integrated Intel Graphics/Video. Match your part number or give us a call if you're not sure which motherboard to select. You will receive ONLY what is pictured. IO boards and cables are not included. 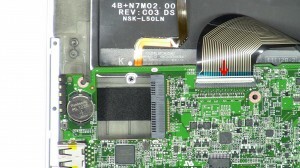 We have made the installation of your Dell XPS XPS 14z L412Z Motherboard a simple DIY project. Just follow our step by step instructions. We have written and video installation tutorials available. Save time and money by doing your own Dell laptop repair.